Healthiana: What Is Pollen Count? Most of us have seen in the news a pollen count report/forecast, but we may want to understand the further significance of pollen count for reducing allergy symptoms, and how it is measured or obtained. The pollen report is usually displayed as “low – medium – high “, to indicate the amount of pollen in the air. It is usually displayed with daily notes on the different types of pollen existing in the air. How pollen count is measured? Pollen counts are measured in easy methods; commonly a small detector or device in which a glass sheet is placed to collect pollen over a certain period of time. The device is fixed on top of buildings where there is wind – to carry the pollen – and when the air enters the device, the pollen lands on the glass sheet. After that, the sheet is covered with transparent chemical substance – petroleum jelly/Vaseline – and then examined under the microscope by an expert to identify the types of pollen. The measure of pollen count doesn't happen on daily basis as many might have thought. The reports are taken as average pollen count measured at similar times over the years. Pollen may travel very long distances with higher wind velocity. That fact should be considered with the direction of wind. Another matter that must be taken in consideration is that the pollen count differs from place to another according to the type of local plants. And the type of local plants in the area where the pollen measurement is taken, affect the count as they differ from one area to another. 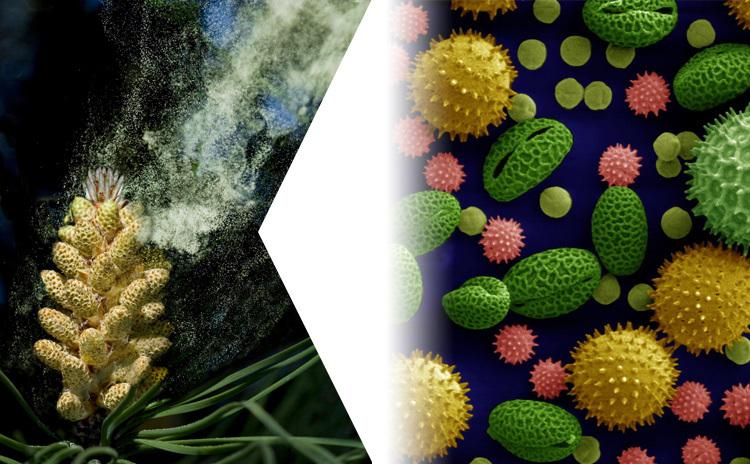 Why pollen count is important? It is important for people with allergy to watch the daily pollen count, in order to understand the degree of symptoms they may experience. Some people should be wary of the severe consequences resulting from high amounts of pollen in the air, and seek a medical assistance immediately when their symptoms develop. It is supposed that people with highest degrees of allergy will develop symptoms with the least pollen count, and those are less allergic may experience symptoms with highest pollen count. There are not many researches that show to what extent pollen allergy symptoms can happen. All researches are not quite accurate and they may apply for only a few cases. Patients with pollen allergy can reduce the symptoms they have in case of knowing which type of pollen they are allergic to.